Die Siebenburg, so man sunst auch Transsylvaniam nennt - MUNSTER, S.
Title : Die Siebenburg, so man sunst auch Transsylvaniam nennt. Map maker : MUNSTER, S.. Size : 12.2 x 14.3 inches. / 31.1 x 36.2 cm. 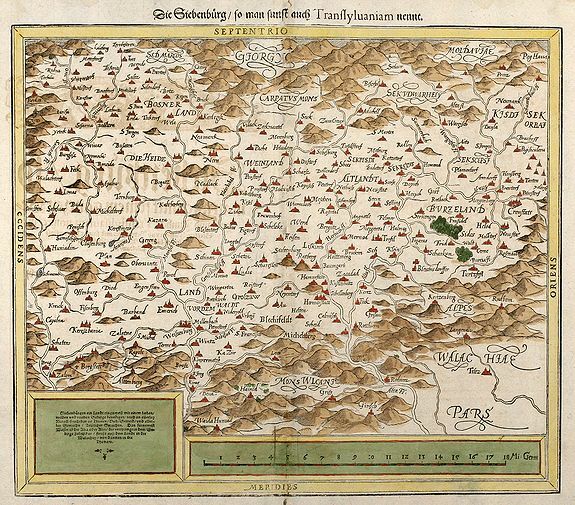 Description :Early, attractive coloured woodcut map showing Transylvania today part of Romania. From a German edition of Cosmographia from Sebastian Munster. Condition : Marginal damage around centerfold backed. Fine condition in beautiful hand colours.